Eighty-six. 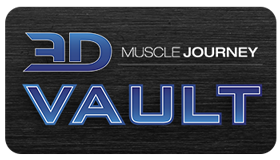 It took eighty-six episodes before the 3DMJ coaches felt the necessity to record a podcast on supplements. Hopefully this statement alone conveys the minor role supplements play in one’s strength and physique goals. 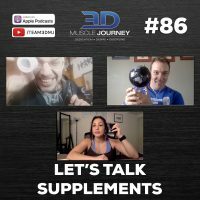 Rather than breaking down individual supplements and studies, Andrea, Eric, and Brad spend the majority of their time discussing big picture concepts. Some of these include: the importance of having realistic expectations, the placebo effect, the relationship between business and ethics, deception, and more. When most people think of worst case scenario from consuming a “bad supplement”, they think waste of money. The coaches make it quite clear that this isn’t true, and that aside from financial losses an even bigger concern is the potential for physical harm. Join us this week to hear the 3DMJ coaches’ general stance on supplements, and how you can protect yourself and your wallet from this very deceptive industry.